Iowa DOT's innovative design, creative contracting, and accelerated construction techniques allowed the 24th Street Bridge to be replaced while keeping the busy interchange open. This was the first in a series of multi-state efforts to improve the capacity of the Interstate system in and around Council Bluffs. The interchange was a key junction of East-West I-80 and North-South I-29, and heavy traffic meant that the roadway had to remain open during construction. A project of this magnitude is typically constructed over two consecutive construction seasons, but due to the critical location of this interchange, traffic restrictions on 24th Street had to be limited to a single season. Well-planned construction staging and intelligent transportation systems ensured that traffic capacity was maintained throughout the process. 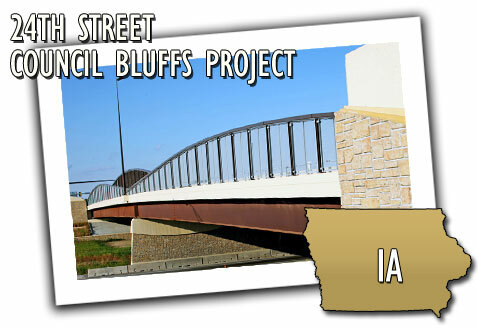 The 24th Street Bridge construction successfully minimized effects on the surrounding community and businesses.